An easy way to get your home ready for the spring season is to put that table setting decor in a rotation. Along with the linens and the fairy lighting, think about displaying eye-catching fresh centerpiece that is 100% seasonally appropriate and fit well the blooming outside. 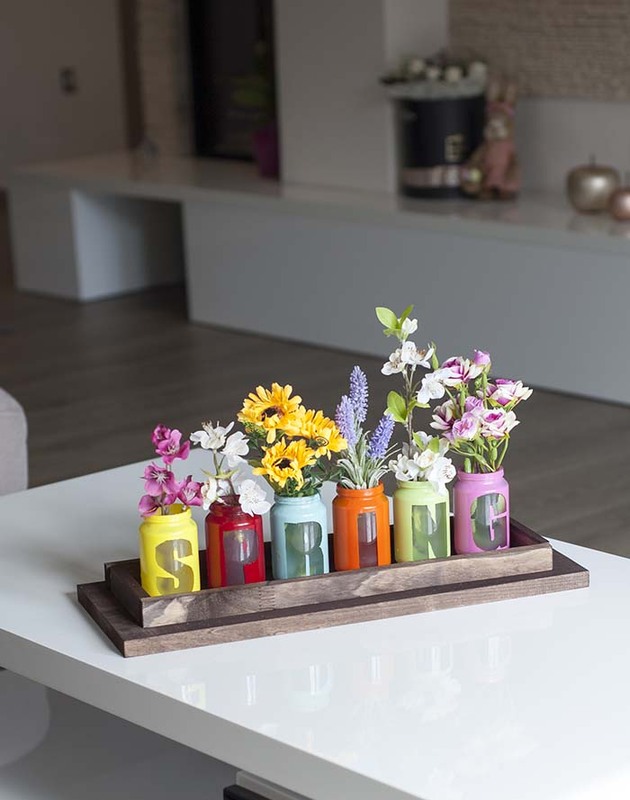 While crafting, keep in mind that spring is a lighter and fresher kind of gathering than its homey winter equivalent, and your DIY centerpiece must reflect that. Use elements that are available during this time of the year and that are airy and whimsical. Struggling to find the right amount of inspiration? Worry not. Here are 20 adorable spring centerpiece ideas to lighten your home. I decided to start with one of the easy spring centerpiece ideas. Display a fresh spring flower arrangement in a Mason jar painted in acrylic paint of your choice. 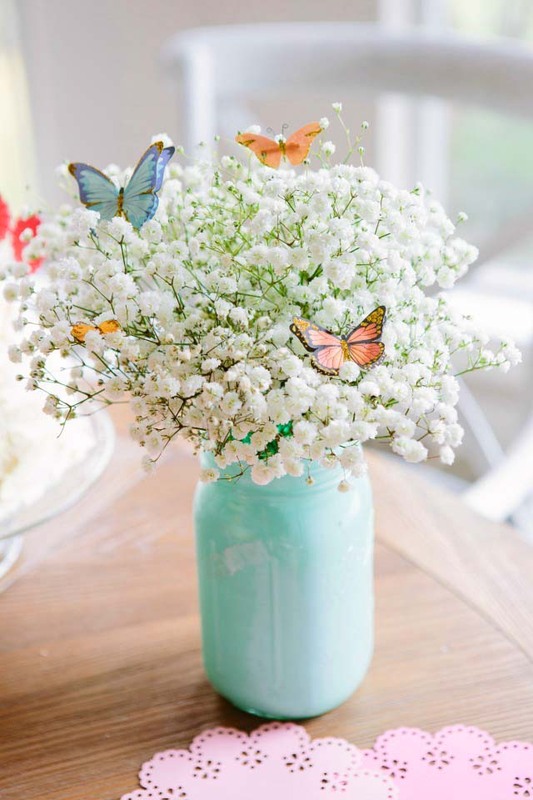 Then stick a bunch of decorative butterflies to make embellish the spring vibe. 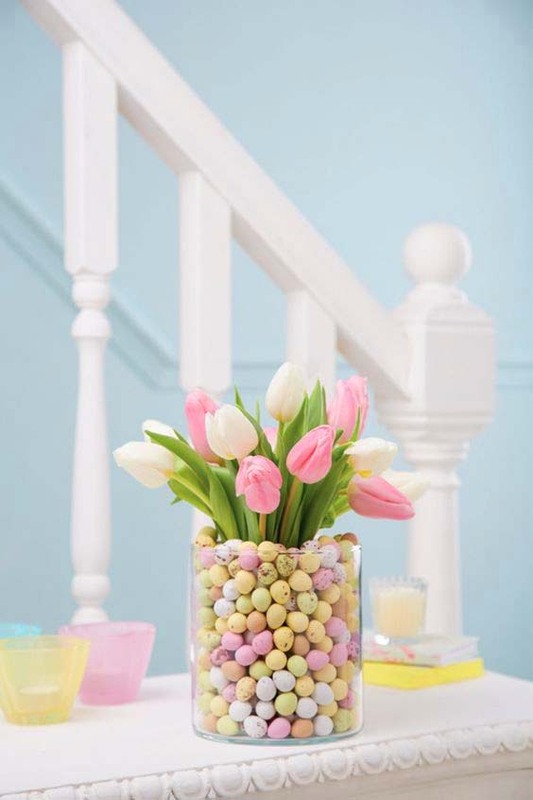 Everyone would admit that the chocolate mini-eggs in a glass vase create a quirky tablescape. 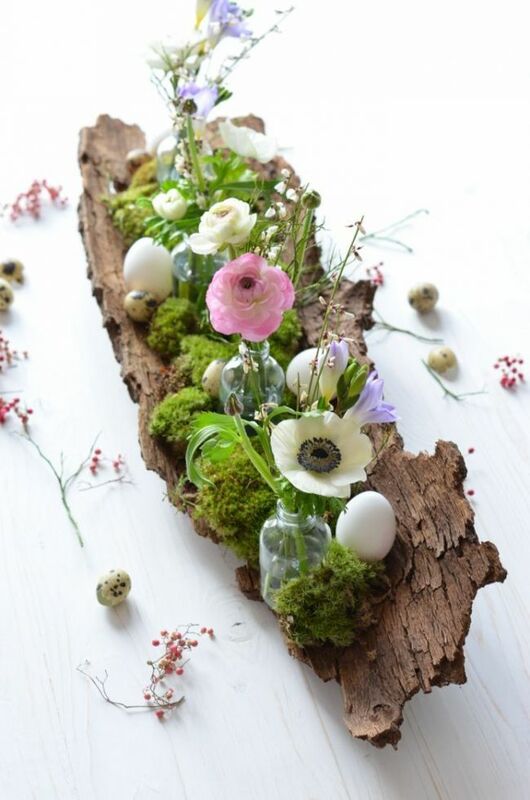 Display some spring flowers in the same color palette to give this centerpiece an additional texture and use it for Easter decoration. If you are looking for cheap ideas that look fantastic, consider re-creating this DIY rustic centerpiece decoration. 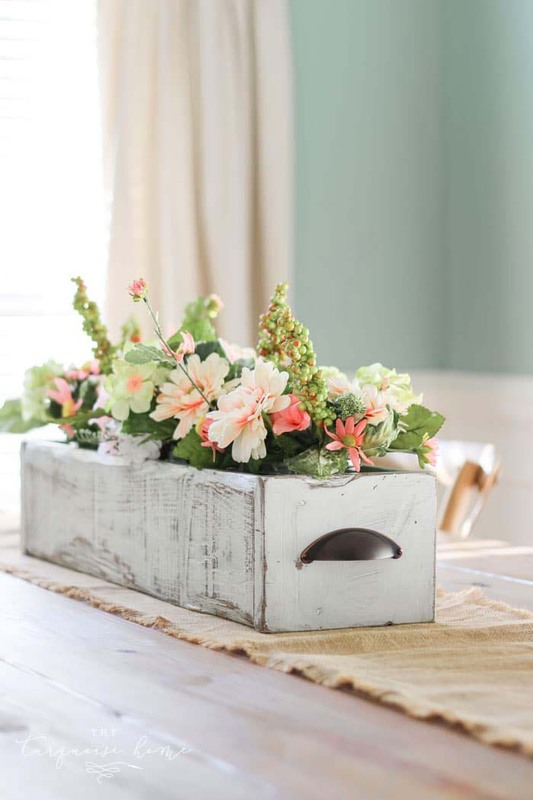 It is made of a reclaimed wood box and a bunch of potted spring flowers in pastel tones. Simple and sophisticated! If you spend an hour browsing on Pinterest, you might see lots of spring wedding centerpiece ideas. Most of them (including this one on the picture above) are very delicate, conversational and cheery withou necesserily breaking the bank. 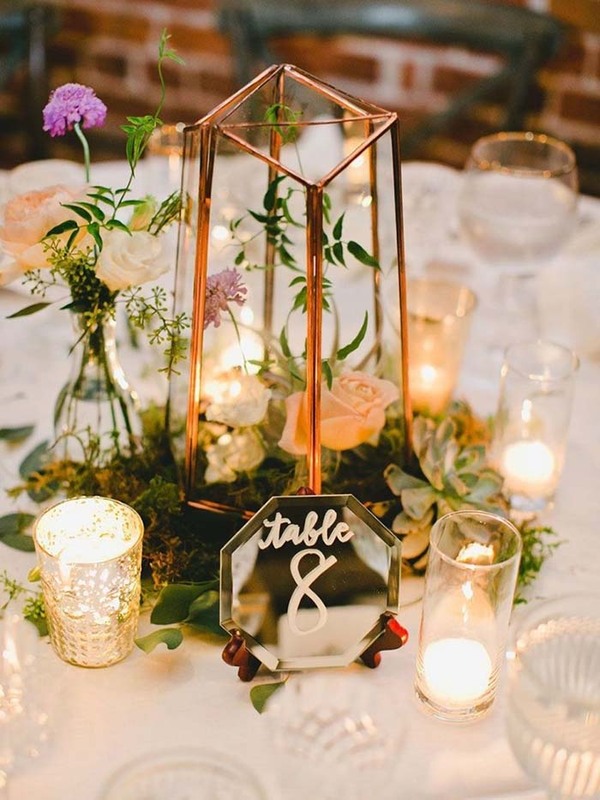 If you are one of these people who love the spring table centerpiece ideas that are very literal and showy, here is a project that may interest you. 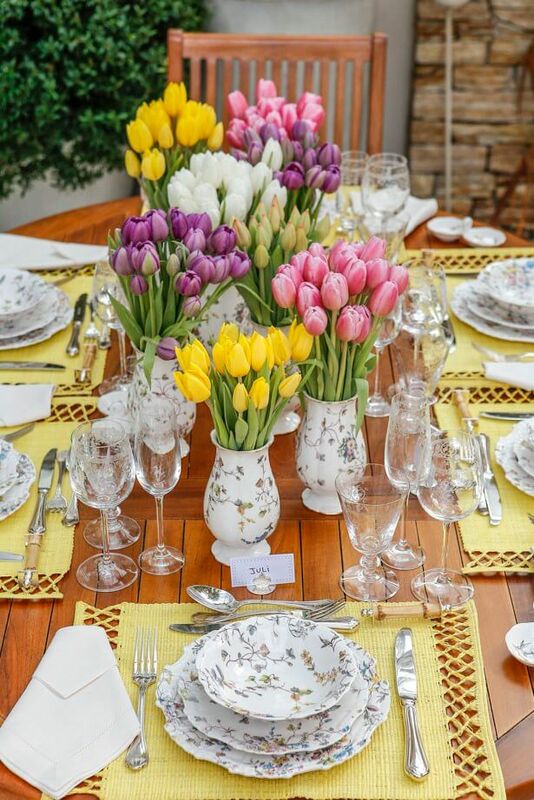 All you need to do to re-create this table setting is to display several vinatge vases in the centre of the dining table and to display tulips in various colors. The result in three words – vivid, joyful, stunning. While searching for table centerpiece ideas for spring, remember – when daffodils are blossoming everywhere, it surely makes it feel like spring. These flowers pair well with contemporary interior design as well as rustically chic home. 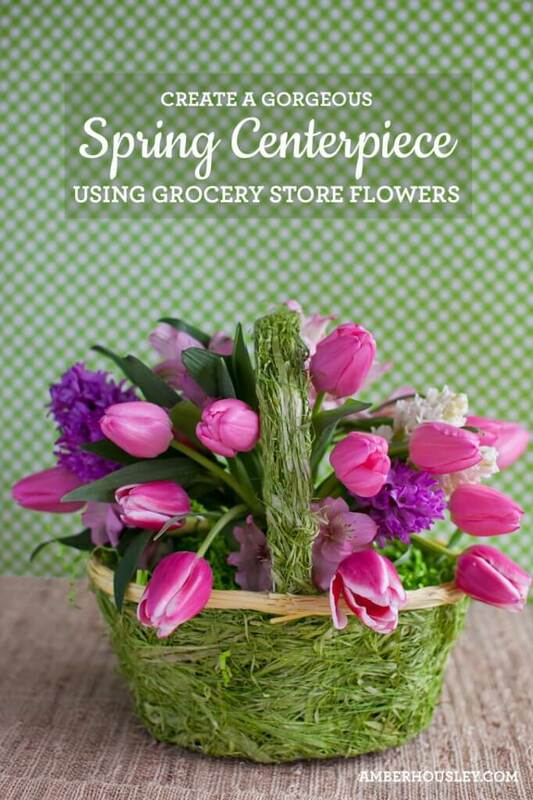 This is one of the most inexpensive spring centerpiece ideas that I’ve ever seen. 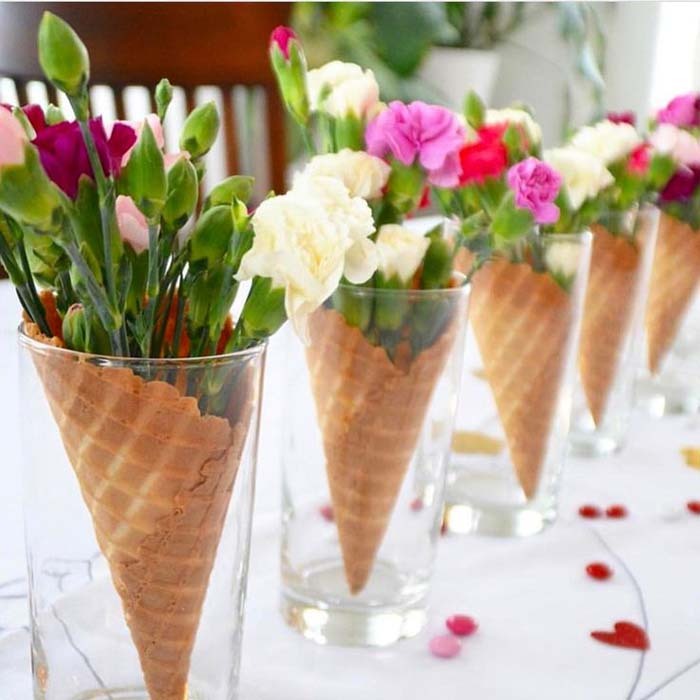 You just have to display some vivid seasonal flowers in ice-cream cones and leave them in simple glass cups. Easy and adorable, right? It will surely make your guests talking. 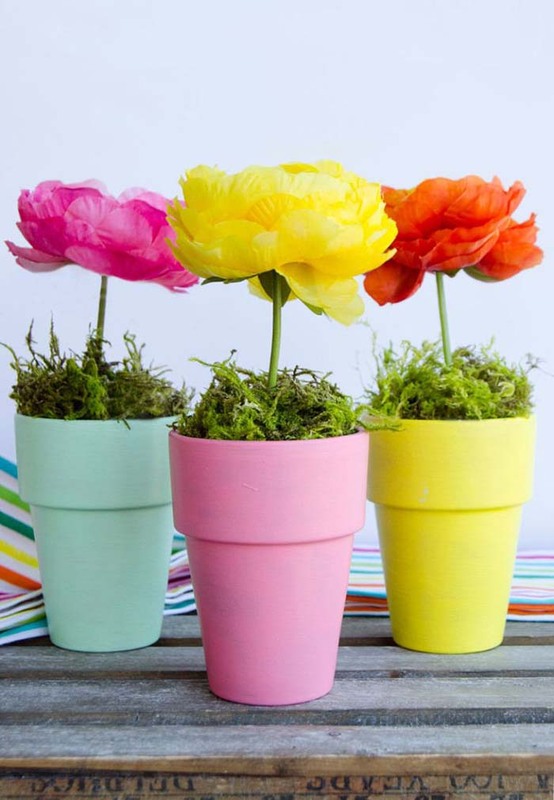 All you need for this amazing craft project is: stems of faux flowers, clay flower pots, acrylic paint of your choice for each pot (you can make 3 or more), sponge brushes, simple floral foam, real floral moss and a knife. You should totally add this to your list of cheap DIY spring table centerpiece ideas. 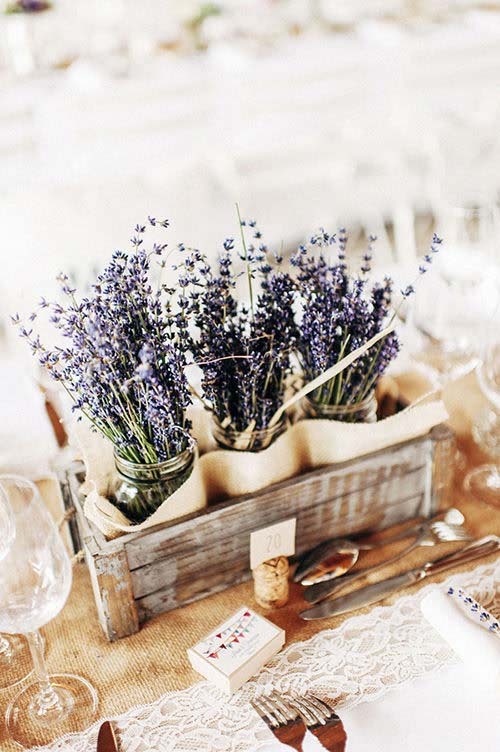 A fragrant bouquet of fresh lavender inspires a carefree beauty to the rustic-themed table. 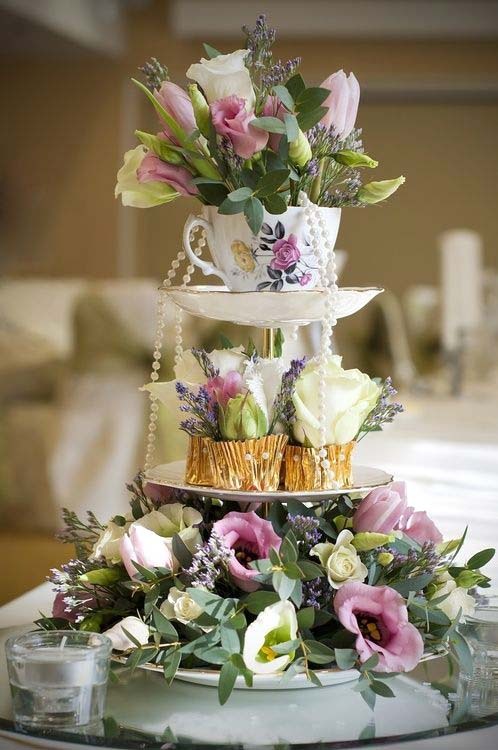 Set the small vases housing the flowers within a wooden crate and loosely enclose them in a organic fabric. There is not much to do about this spring table centerpiece. 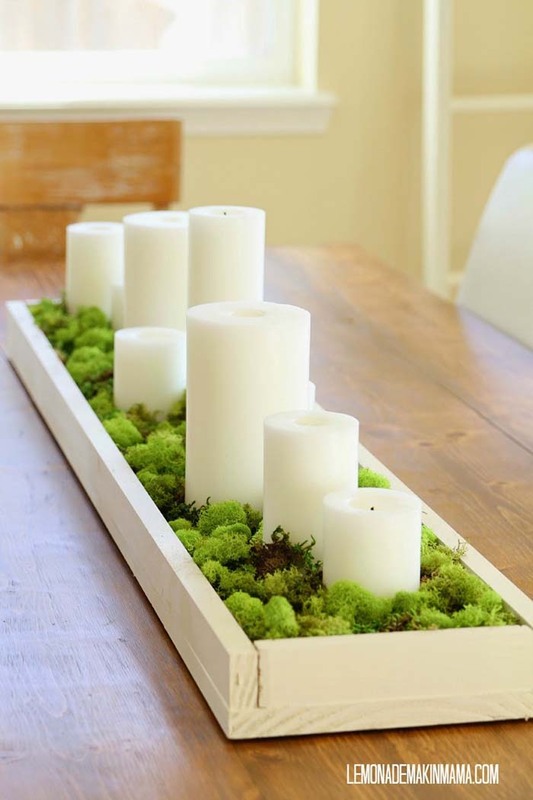 Just lay a bunch of plain candles in a wooden tray and get them arranged how you want them. Then fill the gaps with a reindeer moss, collected from the nearest forest. And voila! Done. 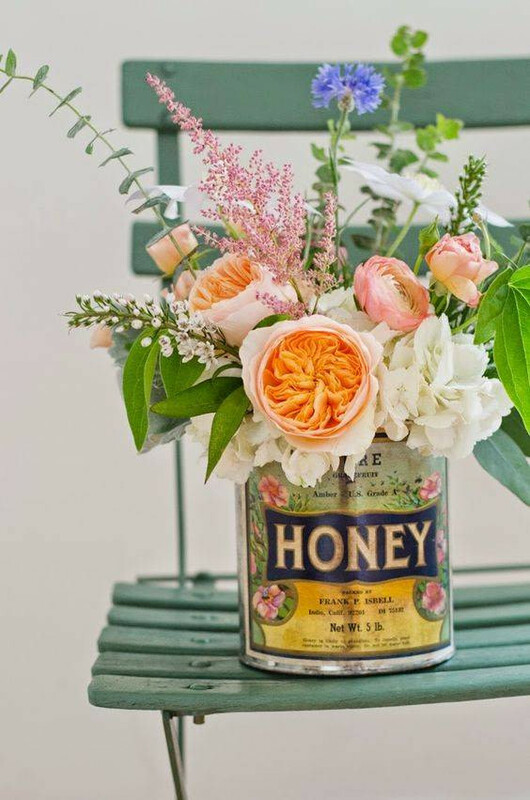 You certainly have leftover tea and honey tins in the garage, and if not, you can always find some pretty ones at any garage sale or at your local flea market. They appear in all forms, sizes and seem to be the ideal vessel for a simple spring floral arrangement. 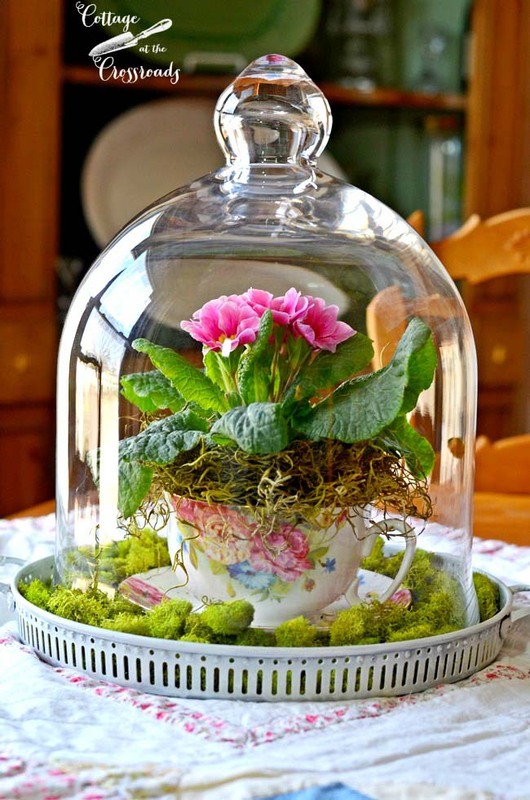 What would you say about this adorable spring floral arrangement under glass cloche? The primroses are being used for many spring centerpiece ideas because they are very lasting, come in various colors and remind us about the long-waited spring. 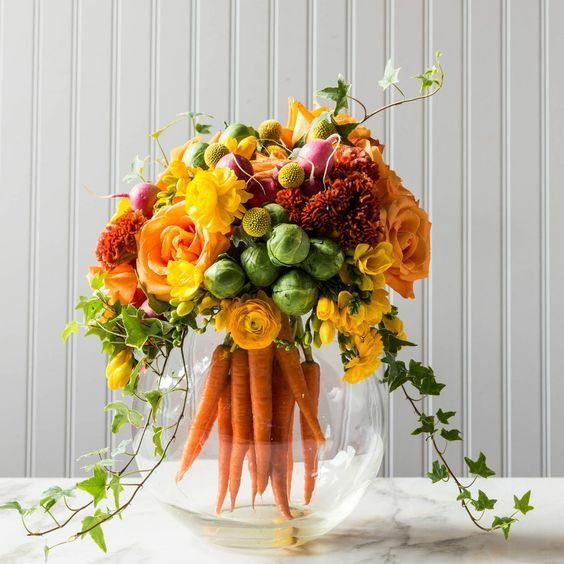 If you are also a fan of the unusual spring centerpiece ideas, you will probably love this veggie table setting. It’s not just conversational and stunning, but it also reminds us to eat and live healthily, don’t you think. I am thrilled to share with you one of my favorite ideas for spring centerpiece! 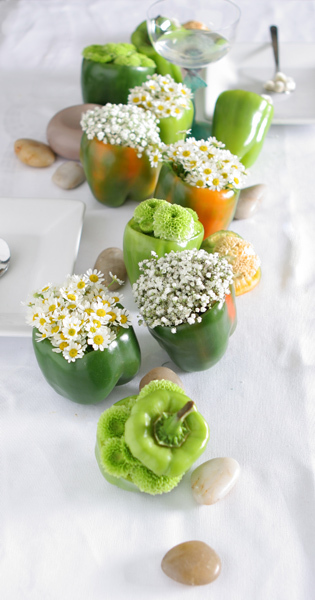 Transforming large green peppers into daisies pots is a great way to make your spring table look joyful and inviting. This is another chic idea to celebrate the long-awaited spring season. 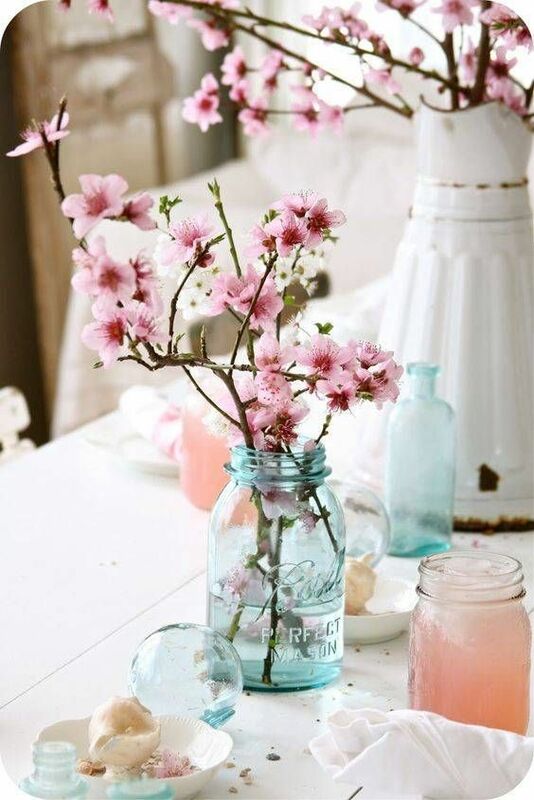 All you have to do is to display a couple of large Mason jars housing cherry blossom branches ( or any other branches from a spring flowering tree ). The table setting has some much simplicity and style! Speaking of easy spring centerpiece ideas, I’ve got more to show you! 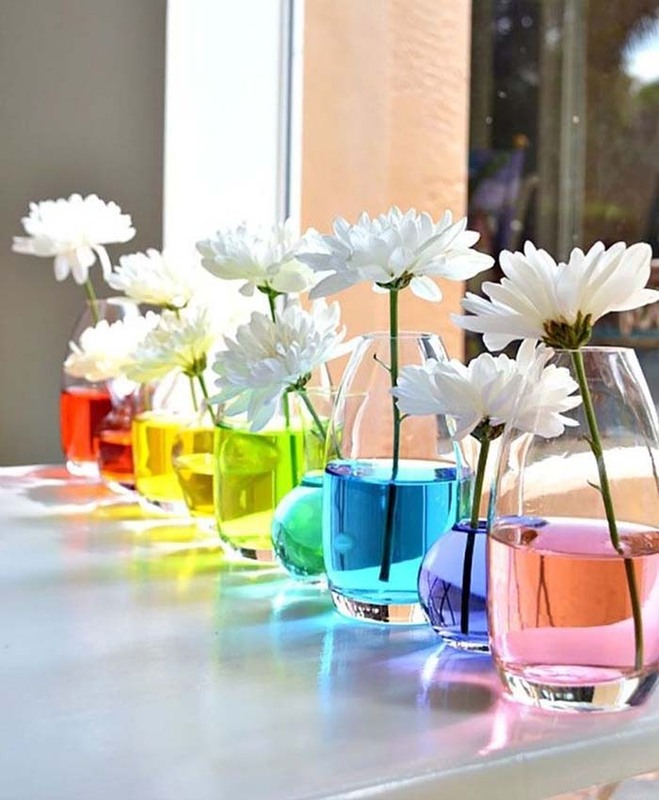 You can use simple glass vases or various glass cups, filled with water. Add edible food paints in different colors to the water in order to create a cheery, rainbow-themed twist to this centerpiece. In the end, display some white spring flowers of your choice. After sharing a bunch of easy centerpiece ideas, I decided to give something for the more experienced DIYers. This handmade spring basket, covered with faux grass, is housing a bouquet of pink tulips and dark purple hyacinths. Lovely! All you need to re-create this majestic vintage centerpiece is a 3 tier cake stand, some of your favorite seasonal florals and…your imagination! It could be a part of a vintage style wedding decoriton or a decor for a sophisticated hen party. 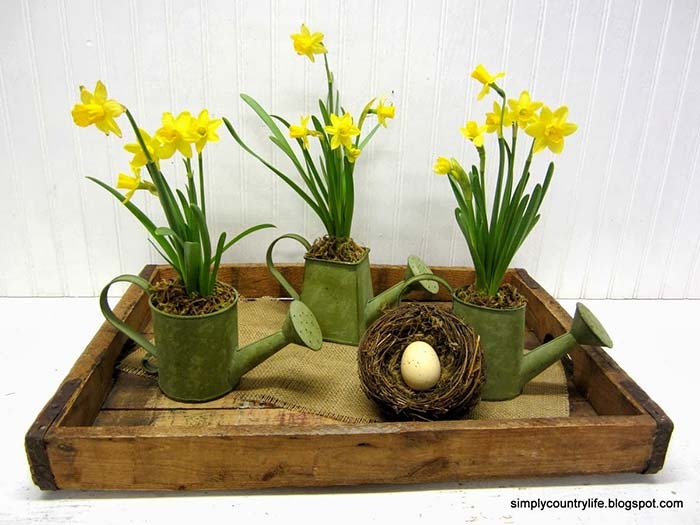 This compact DIY table setting on the picture above is a great idea to celebrate Easter without spending too much money. Most of the elements can be collected from the nearest forest which gives an additional warmth and unpretentiousness to this decoration. Some landscapers may think that the overflowing blooms of the Golden Bell, also known as Forsythia, are too showy, but this composition is just right. 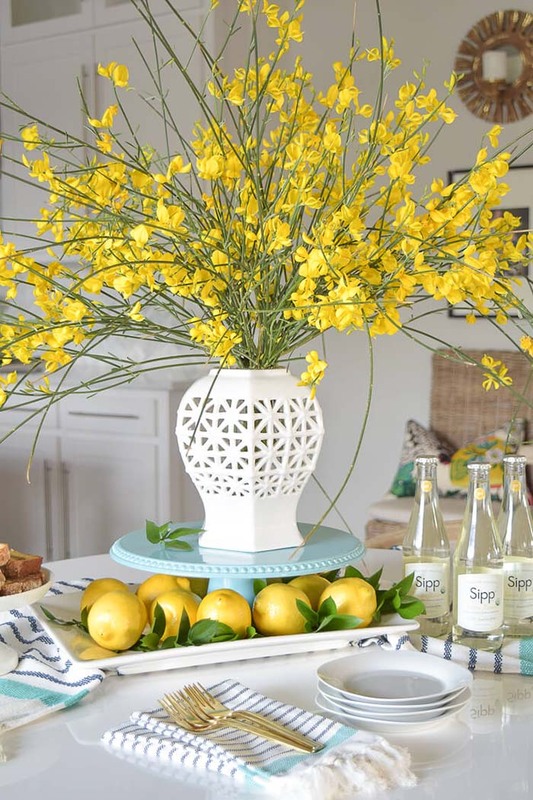 The golden blossoms are utterly designed in a large geometrical vase, and the vase itself is fixed on a blue cake platter on another platter filled with lemons still joined to their leaves for a more natural look. So, did you manage to bring the pristine look of springtime to your dining table with these spring centerpiece ideas?